SYDNEY PICKLES & BLERIOT MONOPLANE AT BURTON At the 1913 aviation meeting in Burton, Sydney Pickles won the prize for achieving the greatest altitude, 6,100 feet. Los Angeles, California - Number 20 SYDNEY PICKLES, retired, 378 Newport Avenue, Victoria, B. C., Canada, a relic of the days of the early, 1912 Bristol on Salisbury Plain, on which he soloed May 29, Royal Aero Club certificate 263 of July 30, 1912. Chief test pilot for Short Brothers, Blackburn Aeroplane Co., Fairey Aviation Co., Flight Lieut. British Royal Navy, 1914; pilot on air mail survey flights in Australia in 1920, instructor Victoria Aero Club, 1928. He has had a long and brilliant career as will be remembered by all of the oldest oldtimers. BLERIOT MONOPLANE AT BURTON Sydney Pickles preparing for takeoff in his 60hp Anzani powered Bleriot monoplane during the second Burton aviation meeting at Bass's. ONLINE RESOURCES If you search for "Sydney Pickles +aviation" using the Google search engine, (9-12-03), you will find only two links. The one immediately below is a fantastic resource. The other one appears to be obsolete. I wish to thank Mr. Andy Holt, EJITU Web Development Manager, for graciously allowing me to reproduce the photos.You will find that this website is a unique resource and offers photos of immense historical interest. I am sure you will want to spend some time enjoying the other photographs and features. You can access it by clicking on the title above. 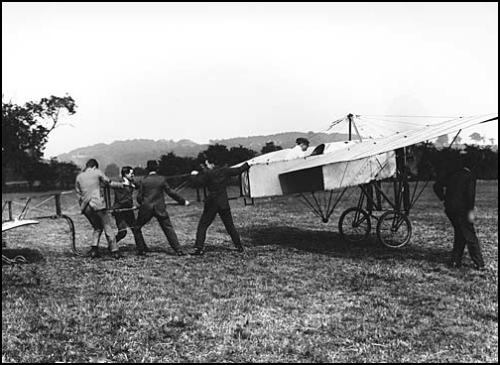 Bleriot monoplane at Burton On this page of the Staffordshire Past-Track website, the first in the series of three, you will find a thumbnail of Sydney Pickles in his Blériot ready for takeoff, 1913. It is the source of the photo immediately above. You will find a total of 12 thumbnails on this page and there are two other pages available. You can access it by clicking on the title above. I saw your very interesting site on Sydney on Yahoo...well done....I admire those that take the time to enhance our aviation history. I thought a scan of the autograph Ive just acquired may find favor in your archives. As an aside I was in the Victorian Aero Club many years ago and have my 'Wings' from the RVAC , (Royal Victorian Aero Club), proudly on the side , although I can only claim to have gone solo there as I finished off the license in Queensland ! Editor's Note: My thanks go to Tony for sharing this piece of historical memorabilia with us. 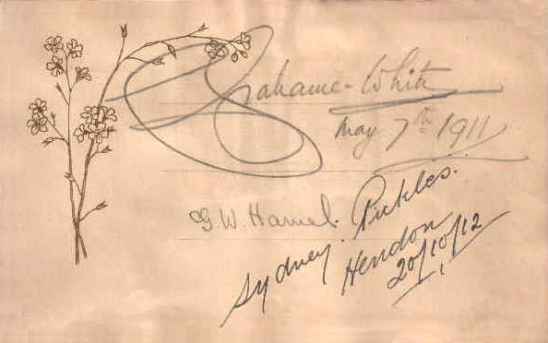 Note also the signatures of Claude Grahame-White and G. W. (Gustav) Hamel. On 14 June 1919 John Alcock and Arthur Whitten Brown took off from Newfoundland in their open-cockpit Vickers Vimy converted bomber to attempt a non-stop crossing of the Atlantic. Some 16 hours later they landed at Derrygimla in Connemara, Ireland, to become national heroes. Navigating blind for most of the way, they had flown almost 1,900 miles, the longest distance ever flown by man. 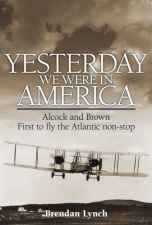 In researching one of the most significant flights in history, Brendan Lynch has drawn on the written records of Alcock and Brown, and interviewed the last surviving witness of their dramatic arrival in Ireland and the adventurer Steve Fossett, who recreated the flight in 2005. He went to England in early 1912 to learn to fly and he successfully passed the tests for his English FAI certificate No. 263. In 1913 he passed more official tests and obtained Superior Certificate No. 8. He joined the Royal Naval Air Service at the outbreak of World War I in 1914 and took part in submarine patrol over the North Sea and raids over the continent. He also trained other pilots for the war effort. After one year he resigned his commission and returned to civilian life as a test pilot for the British Admiralty. In 1919 he received Air Ministry License No. 9. After the war he returned to Australia taking with him his own plane, a "Jenny" with which he established many "firsts' in that country. In 1925 Sydney moved to Victoria, B.C. and organized the Victoria Aero Club. He was the Chief Instructor until one of the members smashed the plane in an accident. 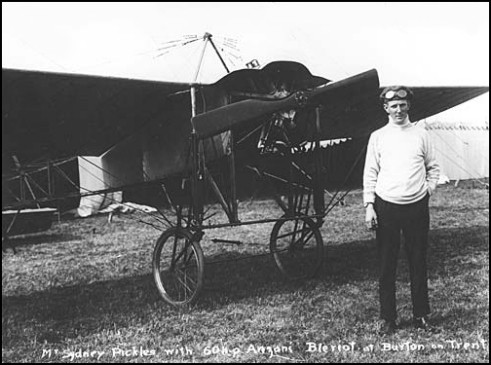 This really finished Sydney's flying career as he could not afford to purchase another plane. After this he headed up a program through which appliances of various kinds were loaned without cost to handicapped persons. For this work he was named Citizen of the Year. He is survived by his wife, Adelaide, two sons and five grandchildren.